When Marcel Vogel was doing public speaking or interacting with so many people, he realized that each individual could benefit from a protective shield of love. He then designed the amazing pendant with sacred angles and facet design. In the centre of the triangle are two smaller triangles, one on either side, facing opposite directions and forming the Star of David. The crystal can be programmed with any thought or intention the wearer chooses. When imprinted with the thought of love and well-being it acts as a protective shield from unwanted energies. Marcel recommended that the Star of David Jewelry be worn over the thymus gland (or witness area), just above the heart chakra. These are wonderful individual pieces that we are bringing you, we have limited stock currently, but will be getting more in stock. 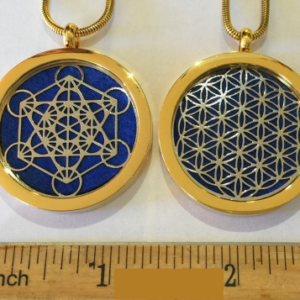 We have been both wearing these over our Thymus gland (or higher heart) and it has helped with not only protection but our spiritual ascension as we face many spiritual challenges on a daily basis. Comes with complimentary .925 Sterling Silver chain & black velvet box. This Star of David cut, originally designed by Marcel, is a two dimensional symbol of the “Merkaba Vehicle”, or Vehicle of Light. This “Vehicle” is comprised of two, three dimensional three sided pyramids. One pyramid is point up (representative of the Male aspect of duality) and the other is point down (representative of the Female aspect of duality). In other sacred traditions this is referred to as the Yin/Yang, or Shiva/Shakti energies or aspects. Merging together they create a Star Tetrahedron. This geometric energy grid, representing wholeness, is said to be the Light Body Vehicle which we incarnate into this world with, and which when properly activated allows us to transcend the physical world, in a process referred to as Ascension. This Merkaba or Light Body Vehicle also serves as an “Energy Antenna”” connecting us with our Creator and all of Creation. It is constantly shifting, moving, and dancing in rhythmic flow with our creative conscious and subconscious mind. Using this Crystal Star of David as a visualizing tool, one can become more aware of their own energy grids: clearing, healing and creating what is chosen. Because these beautiful light tools are cut precisely from quartz, they move and amplify energies in a certain direction and can be programmed. The Female side [negative, magnetic, inverted triangle] draws energy in. This energy is then amplified and “flavored” by the program and the type of quartz. The now amplified energies are radiated out the Male side [positive, electric, aligned triangle]. When wearing a Star Crystal with the Male side out, the Higher Self energy is drawn from within, amplified, and radiated out into the aura, making it so brilliant it can act as a shield. Wearing a Star Crystal with the Female side out draws energies from the environment, and amplifies and directs them into the body. Therefore, wearing it with Female side out would best be done only in a sacred place or in a positive/healing type of environment. Aqua Aura Quartz Crystal Jewellery Star of David 925 Sterling Silver chain.